This Monday not only marks the 70th anniversary of the "foundation" of Israel, but it will be the day when the United States finally put aside political correctness and planted its definitive support for an Israeli country that helped to found, forgetting and rejecting the Palestinian cause by omission. President Trump announced the transfer of the US embassy from Tel Aviv to Jerusalem last December, a diplomatic move that "officially" recognizes Jerusalem as Israel's capital and certifies the displacement of the Palestinian population to the margins. Its final inauguration will take place this Monday, May 14, in the presence of the president's daughter, Ivanka Trump, her husband Jared Kushner, the Secretary of Treasury, Steven Mnuchin and several Republican members of Congress, according to Vox. Meanwhile, thousands of Palestinians have gathered on the Gaza-Israel border for the seventh consecutive week to protest a territory that has been forcibly taken from them, resulting in the deaths of dozens of people and hundreds of wounded. For many, the Jewish man is deeply Westernized - perhaps as much as the Christian - after he lived for centuries scattered throughout various parts of the world in what became known as the Diaspora. After persecution, rejection and, especially, after the terror of the Holocaust, the so-called Political Zionism emerged, an international movement that "claimed a state of its own for all the Jewish communities scattered throughout the world." 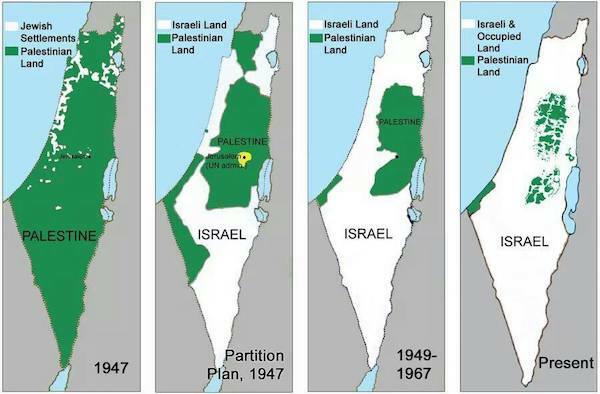 The thing is that this movement claimed a territory stipulated by religious documents and determined by the "promise of God to his chosen people", but neither Israelis nor Palestinians were originally from that territory according to historical research. Both ancient peoples - Hebrews and Philistines - came from outside regions and were gradually conquering the territory, succumbing simultaneously to the power of Babylonians, Assyrians, Persians, Macedonians, and Romans. It was the constant revolts of the Hebrews during Roman rule that caused the empire to ban and punish some Hebrew traditions, giving rise to the first massive exodus. Thus, since the formation of the province of Syria, the population was homogenized in broad strokes, always considered as Palestine. Between the end of the 19th century and towards the end of the First World War, the Ottoman Empire (also known as the Turkish Empire) dominated much of the Arab territories, stipulating the beginning of Islamic theocracies. Subsequently, and during the interwar period and the Second World War, Palestine was under British rule, until the exodus of the Holocaust altered the demography of the territory to which so many Jews returned fleeing. Despite the insistence of then-US President Harry S. Truman for the British government to offer immigration certificates to 100,000 Jews, the conflict between British and Jews was imminent, and finally the former would withdraw from the territory, leaving an unprepared Palestine in front of the cavalry of the Zionist movement. On November 29, 1947, the General Assembly of the United Nations approved the Partition Plan for Palestine in two States: one Arab (46% of the territory) and one Jewish (54%). Between both, both Jerusalem and Bethlehem would form a corpus separatum of 700 square kilometers under the administration of the Trusteeship Council of the United Nations. The Jews accepted the proposal celebrating their independence on May 15, 1948, but the Arabs rejected it as "absurd." From that moment on, the territory has been the epicenter of the instability in the region, with an attempt of invasion in 1948 by the Arabs that resulted in Israel as the winner, annexing 26% more of the territory, and the Palestinians being betrayed by Transjordania and Egypt, who appropriated the remaining part and transformed it into Jordan. After the 1948 war, Jerusalem was divided into two parts: the western part, which was proclaimed the capital of Israel in 1950, and the so-called East Jerusalem that included the Old City and which came under Jordanian control. Because Israel has always claimed the city as the "religious and civil capital of the Jewish people," during the Six Day War (June 1967), Israel advanced to the Wailing Wall in the Old City and unified the capital under its power. In 1980, the government declared the city as "eternal and indivisible capital" through the Law of Jerusalem, but the UN has maintained that, through its resolution 478, the Jerusalem’s condition of capital would be invalidated for international diplomacy, advising all countries to maintain their embassies in Tel Aviv. Simultaneously, the Palestinian National Authority claims East Jerusalem as the capital of the Palestinian State. The result of the conflict has been around 4.62 million Palestinian refugees who have lost homes, territories and relatives, as well as living conditions, labor benefits or even guaranteed security. The attacks and constant persecution by the Israeli regime have triggered phenomena such as the First and Second Intifada (Palestinian revolution against the invading Israeli forces), the emergence of extremist groups such as Hamas and the resulting massacres on the Gaza border, and the almost absolute disappearance of the Palestinian territory. It is as if Israel, little by little, was transforming itself from victim to perpetrator. According to the analysis of Oren Liebermann (CNN reporter based in Jerusalem), the transfer of the US embassy to Jerusalem "means that Washington effectively recognizes Jerusalem as the capital of Israel. That would mean repealing 70 years of international consensus and, for many, it would be a definitive sign of the end of the movements to achieve peace between Israelis and Palestinians." According to Liebermann, Israel has leased a plot in Jerusalem since 1989 to the United States for 1 dollar a year for 99 years, a land that remains empty to this day. "In 1995, the US Congress passed a law obliging the United States to move its embassy from Tel Aviv to Jerusalem," the reporter continues, but previous presidents had avoided making the move," citing national security interests. With Trump, that scenario has radically changed.